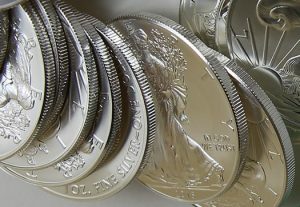 Inventories of bullion 2018 American Silver Eagles are depleted for now, the United States Mint told its Authorized Purchasers (APs) today, Sept. 6. "This is to inform you that due to recent increased demand, the United States Mint has temporarily sold out of its inventories of 2018 American Eagle Silver Bullion Coins. The United States Mint is in the process of producing additional 2018 American Eagle Silver Bullion Coins. We will make these coins available for sale shortly." Sales of the 1-ounce, .999 fine bullion Silver Eagles jumped today by 637,500 pieces, for a year to date total of 10,275,000 coins. Their weekly tally grew to 1,037,500 coins, which is higher than the sales in every month this year except for January and August. Bullion American Silver Eagles are sold in bulk through the Mint’s network of "Authorized Purchasers" who consist of major coin and precious metals dealers, brokerage companies, and other participating financial intermediaries. APs pay $2 per coin, plus melt value. In the secondary market, bullion coins are usually priced at a few percentage points above the latest value of their precious metal content. If supply has run out because of “demand” shouldnt prices then be higher and not at rock bottom lows? Someone explain. Prices being manipulated by central banks, US debt clock values silve @$640 per Oz if you factor the debt and inflation. I say this is a big sale and i will go buy more, silver is the most under valued commodity on the planet and it stores so much value. Silver is up 1.1 million % in Venezuela right now because of the hyper inflation. market fuckery using hedging algorithms, leveraged financial tools such as futures contracts and the ablity to only need to hold 1 OZ of actual metal for, in some cases, the value of 450 OZ on ‘paper’ derivative products. Reason: They don;t want you in silver gold or bitcoin. They want your money in treasuries/ DEBT ! !